In an ever-changing employment market, it pays to be innovative in your hiring practices! As an employer, attracting the right people to join your team is key. 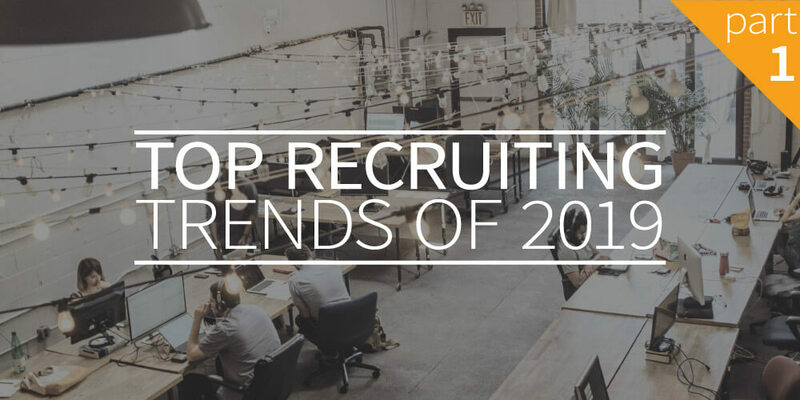 Using the best processes to approach, attract, screen, and hire new talent can save time and money, and will ensure that you’re drawing in the very best employees.In this blog post, we will share 4 of the top recruiting trends for 2019, from game-changing HR technology to creative methods that will change your approach to recruiting. In this candidate-driven job market, the importance of recruitment marketing cannot be overstated. Today’s job candidates are increasingly more internet savvy, and they will gather in-depth knowledge about your company before ever setting foot through the door. That means it’s important to paint a clear picture of your organization and the jobs you have to offer wherever prospective employees might be active online. Create a candidate persona or avatar that reflects the skill set, experience base, goals, and personality of your ideal employee. Use that information to create targeted messaging and to analyze on which platforms you should be advertising and communicating. This ensures that you’re targeting potential candidates who will be the best fit for your company. The job market is increasingly occupied by younger generations who expect a certain level of tech-friendliness in their job search and application process. Pay attention to mobile in your recruitment marketing by making job pages and application forms easy to access on a smartphone. Find out how competitors in your field are attracting talent and learn from their approach, whether it’s good or bad. AI tech is a huge development in recruiting and HR technology. Using artificial intelligence in the recruitment process can help automate much of the time-consuming manual work involved, like the screening of candidates, and can help you discover new ways of hiring talent. AI tech can be of incredible assistance in screening job applications, resumes, and CVs for matching skill sets and experience levels. This automation of low-level tasks streamlines workflow, saves time, and reduces operational costs. AI tools can also use data analysis to engage in job matching. Essentially it can flag when a candidate is better suited for a different job offering within your organization, ensuring that you match the right talent to the right position every time. Use AI technology in the early recruitment stages, too, to improve the quality of your job posting! 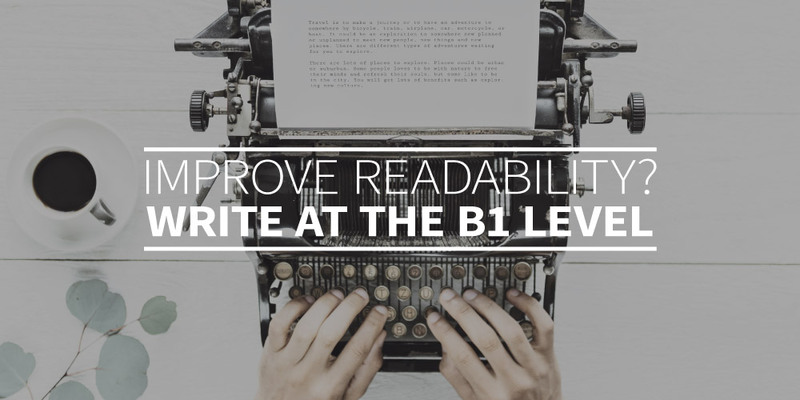 This is where webtexttool can help by making real-time text suggestions and improvements during the writing process. AI can act as a virtual assistant to contact applicants, schedule interviews, manage calendars, and even analyze interactions. Yet another way to save time and effort. AI algorithms can be trained to remove or disregard certain markers in a job application (like name, gender, and age) that could lead to unconscious bias in the candidate selection process. Entrusting that early selection to an automated process can greatly improve the quality of your candidate pool. AI technology can target candidates based on their online behaviour. Analyze the online habits of anyone who may have visited your company’s job page and target people who are researching similar jobs. Then use that data to serve posts about your company’s culture and ads for the positions your company has to offer. A LinkedIn report earlier this year demonstrated that, in this era of booming technology, recruiters are struggling more than ever to find people with excellent soft skills, like listening skills, empathy, and strong communication. Those soft skills are essential in teamwork, collaboration, leadership, problem-solving, and flexibility in the workplace. They are the skills that ultimately drive success and can help future-proof your workforce. So how do you go about hiring new talent with strong soft skills? Determine the key soft skills that are of value to your company. Keep interviews consistent and have a formal process to track and analyze candidate performance in a transparent way. Add a tech element to your interviews and application process. Traditionally, asking behavioural questions is a great way to get some insights into a candidate’s soft skills. But take your process to a higher level with online assessments, like games and quizzes. Those will result in data that is less subjective to assess and much easier to analyze, which will limit bias. Where job recruiting and hiring used to be the exclusive territory of HR departments and hiring managers, the collaborative hiring model takes a whole new approach. This type of team-based hiring requires the involvement of people from multiple departments and various levels within the organization (including employees that would work below the new employee), essentially extending the hiring team. The great part is, collaboration can happen at any and all stages of the hiring process. It starts with building the job description and extends into attracting/referring prospective hires, candidate interviews, final decision-making, and the onboarding of new talent. take some pressure off the HR team or recruiter. get whole teams, departments, and companies to share responsibility and get on the same page. offer a stellar candidate experience, with opportunities to ask important questions about company operations, the culture of the organization, and employee experience. This especially helps with employee retention. limit unconscious bias by increased transparency and more diversity in viewpoints. build company culture and improve team dynamic by including employees of all levels in the recruitment of future team members. lead to improved employee engagement as they become more invested in the hiring process and experience transparency. This also leads to an easier onboarding process. When it comes to collaborative hiring, it’s also important to have the right software in place. The easier it is for the team to share documents, data, and updates, the quicker and easier the hiring process will be. This was just part 1 of our 2019 recruiting trends. Keep an eye on the webtexttool blog for more. And of course, contact webtexttool to find out how our tools can help streamline your recruitment process. We have written about content design before. In short, it is a method to make your website more user-friendly. While that is a great goal in and of itself, you want to know how much time and effort it will cost you and what the results will be. In this blog, you’ll read more about the Return on Investment (ROI) of content design. Let’s start with a quick recap. What is content design exactly? The term was introduced a few years ago by Sarah Richards. She and her team were responsible for the overhaul of the British government portal www.Gov.uk. Which task do users want to complete here? Is this actually a task for the government? The result was a website that won multiple prizes. Even more impressive: she reduced the number of pages from 75,000 to 3,000. Content design is all about creating user-friendly content by putting yourself in the user’s mindset. How much time and effort goes into user-friendly design? Of course, it makes a huge difference whether you want to redesign a whole website, or just a few new or existing pages. An important pillar of content design (and of UX or SEO) is to first form a picture of the needs your users have. Keyword research (which questions is your audience asking?). An analysis of surfing behavior (using a tool like Hotjar). A survey of and interviews with your target audience. Brainstorming with employees and partners who interact with clients. Are you already using these methods of measurement? 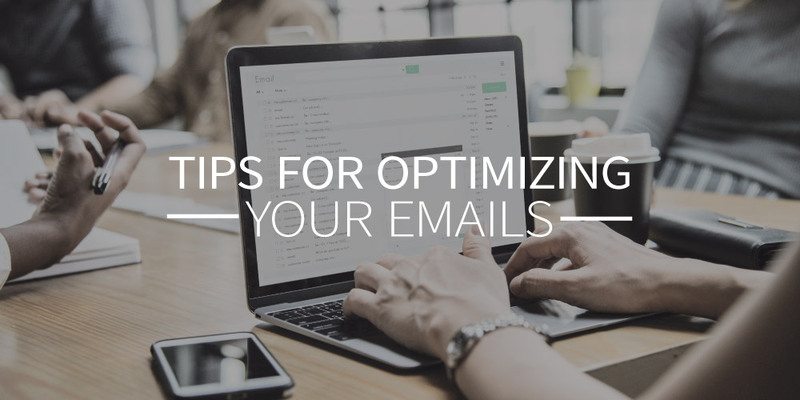 Then it shouldn’t take you too much time to generate input for new user-friendly content. If not, set-up will take at least a few hours, if not a few days, of work. Note that you can use these same tools for SEO and SEA as well. Once you’ve outlined the user stories, you can get started with content production. Usually, that involves a writer and a designer. Estimate how much time each of them will spend creating the new pages, then put that in an outline. TIP: You’ll make the process significantly quicker if you add an automatic check for the SEO of your content. In this example, it will cost you 32 hours to create 8 pages aimed at eight important user stories. 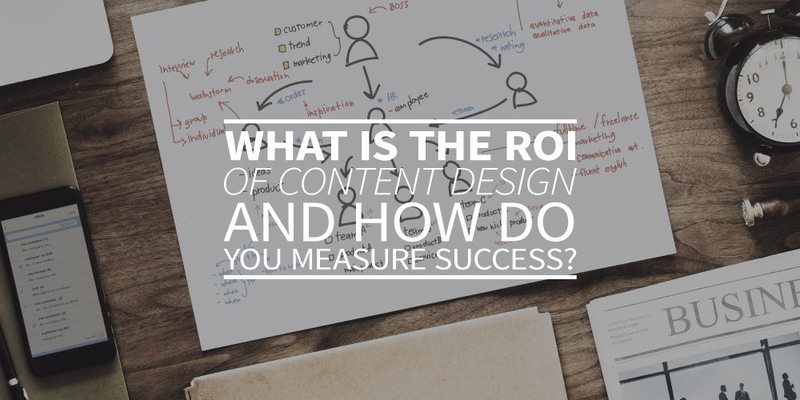 How do you measure the returns of content design? How many visitors are drawn to a page? How many leads are generated from that page? What is the quality of the leads from that page? How many existing leads are visiting the page? How long do visitors stay on the page? How high does this page score for specific keywords? What is the increase/decrease percentage of client service contacts? Many entrepreneurs also want to make a different comparison. What does the ROI of content design + SEO deliver in terms of search engine advertising (SEA)? This is where the comparison gets a bit more complicated. Again, you can use multiple metrics (engagement, visitors, leads, ranking) to make the comparison in returns. But a short-term analysis will skew the picture a bit. A Google ad campaign of $1,000 might bring you $2,000 worth of new customers after a month’s time. In turn, your $3,000 content design + SEO might only bring you $1,000 worth of new customers after the first month. One year later, though, you might see that $3000 of SEA has brought in $6,000 of customers and that content design + SEO has resulted in $9,000 — the initial investment in relevant content will continue to generate new leads. That’s why you should always measure in the long term! Content design is a method for creating user-friendly content by placing yourself in the user’s mindset. That starts with research to determine what your user’s needs are. Then you go on to create user stories, which you can translate into content for your site. A simple table can help you calculate how much time your marketer, copywriter, and designer will need to create the content. Next, it’s time to calculate how many leads, visits, and improved rankings this new content will deliver. Offset those costs against the initial investment. Always measure the long-term results (a minimum of 6 months). 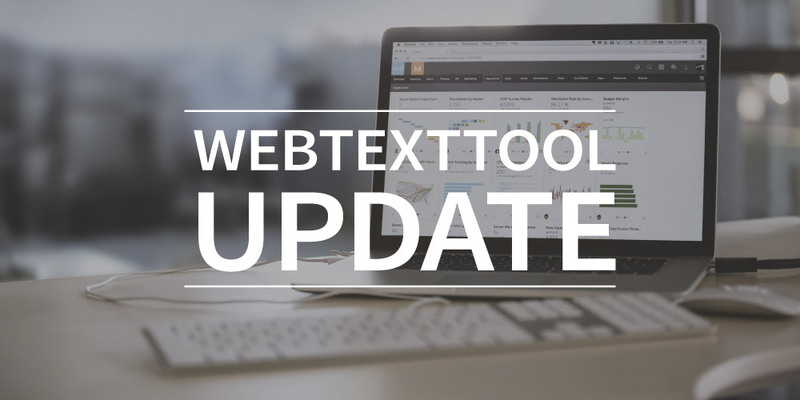 We update webtexttool regularly to add new features and improve existing ones. Does a feature in webtexttool looks different from the last time you used it? In our release notes you’ll find a high-level overview of what we’ve done in each update. In this short blog I’ll give you a quick overview of the main updates we did in the past months. If you have any suggestions and idea’s, don’t hesitate to share them with us at support@webtexttool.com Thank you! A new cool feature is added to the content quality analysis: wordlists. You can set up 3 types of word lists: blacklists, mandatory lists and whitelists. You can create and manage these lists on the Wordlists tab on the My Account Page. A blacklist contains the words that may not be used in your text. Eg. to make sure that you avoid specific jargon. The mandatory list contains the words that must appear in your text. You can use a must-have list to make sure you address mandatory topics. The whitelist contains the words that will be ignored in the analysis. In some cases you can’t avoid using certain words but don’t want them to influence the checks and scores. Check our knowledgebase for more information about the wordlists. When optimizing a text for a keyword or keyword phrase, it’s important that you actually make sure that these words are properly used in your content. Webtexttool of course helps you with that, with the realtime SEO suggestions. So far, webtexttool was quite strict in evaluating your content on this; your keyword / phrase had to be used in the exact way. In some cases this restricted the freedom of writing the text and invoked unnatural phrases. Recently we have added the Smart Keyword Technology (SKT). This will give the writer more freedom in using variations of the keyword/phrase. Webtexttool looks “smarter” at the keywords used in the text and if they match the keyword that you set up. This includes singular / plural, ignoring stop words and more freedom in the order of words when using a keyword phrase. To give you an example: bicycle and bicycles can now be both used and will be considered a keyword match. Projects and Team projects are now merged into one integrated Projects list. Besides that editing Team projects has been made easier. You don’t have to follow the whole team project process anymore, but instead you can directly change project settings and/or manage teammembers. The projects and page lists have a new and improved design. Notifications, eg. page saved, keyword set, etc, now appear in top middle of page so they don’t block important actions anymore. Improved language detection for Content Quality analysis. GDPR Stuff e.g. you can download your personal info that is stored in your webtexttool account simply from your Account page. And we made changes in our backend lick anonymize data and a delete option to delete all personal information on request. We worked very hard on a new interface which gives you an even better experience of creating content! In the past years we have been adding a lot of functionality to webtexttool. The time came to declutter the users interface and reorganize where you can access all functionalities on the editor page. We made a lot of preparations to completely switch to the new user interface in a couple of weeks.